Guys am very much proud to present u the article about the secrets of " our modern bharat mata" by India's most respected Author published in New Indian Express. But, she became loyal to India a trifle late, by 16 years! "Today, my loyalty embraces a wider family — India, my country, whose people have so generously welcomed me to become one of them." This is Sonia Gandhi addressing the University of Tilburg in the Netherlands on June 11, 2007. It is true that the people of India who were always in awe of the Nehru-Indira family — more, who, thanks to their colonial hangover, loved things and people foreign — welcomed the Italian-born Antonia Maino, now Sonia, into the nation’s first family. The people of any other country, including the country from which Sonia hails, would have seriously objected to a foreigner in the house of the rulers. Yes, she is right. The people of India were extraordinarily generous to her and welcomed Sonia the unknown, the stranger, without knowing anything about her. But how about her claim of loyalty to them in return? How loyally did she respond to the generosity of the ordinary and unsuspecting people of India, that she now so generously acknowledges? The chronology dating back to 1968 when, many reading newspapers today, who must have been lying on the lap of their mothers. The chronology brings out what she did in response to the people of India, who she herself acknowledges, so generously welcomed her to become part of them. It shows that from the outset she had decided not to become part of them and remained so for 16 years. Her determination to marry Rajiv Gandhi and enter the Nehru family was equalled by her determination not to become an Indian citizen! She was bent on continuing to remain and remained an Italian and a foreigner in India, not for a while or a year or couple of years testing the waters in India, but, for 16 long years — yes sixteen long years — from 1968 to 1984! It was not that in her blissful merger into the Nehru-Indira family and deluged by affection of the people around her, she forgot all about the technicality of acquiring Indian citizenship. It was not a case of just an accidental omission to apply for citizenship. From day one she was determined not to apply to become an Indian. She consciously chose to remain a foreigner and retain her Italian nationality and passport. The Indian law on foreigners required her to apply for and get permission to stay in India as a foreigner and this she had to do every five years. Determined to live in India and in the Prime Minister’s house as a foreigner, she dutifully applied every six years — first in 1968, afterwards in 1973, thereafter in 1978 and finally in 1983 — for permission to reside in India! So she was just a guest, not part, of Indians for 16 years. She must have decided to remain a foreigner in India even earlier, as she knew long before 1968 that she was to marry Rajiv Gandhi and would have to come and reside in India. Sonia finally applied for Indian citizenship in 1983 and got it in 1984, on April 30 to be precise. Why did Sonia suddenly, and after 16 years, aspire to become an Indian and positively respond to the generosity of the Indians in welcoming her? Any one who knew a little of politics also knew that Rajiv, who became the general secretary of the Congress party after the accidental demise of Sanjay in 1980, was set to become the Number 2 to Indira Gandhi in the government after the elections in early 1985. He could never have become a Minister under Indira with a foreigner as his spouse. This is what forced Sonia to acquiesce to become an Indian. Thus it is not the love of India or the generous Indians who welcomed her that made her to give up her Italian citizenship, but, the real reason was the prospect of her husband ascending to power, which means herself in power! Yet she tells the Amsterdam audience that power never attracted her. She would never tell the truth that she did not want to become an Indian for 16 years and remained a foreigner in India. She would never tell that, even when she applied for Indian citizenship, she applied only as Antonia Maino Gandhi, with Sonia as just a pseudonym. She would never tell that Rahul and Priyanka were under the Italian nationality law, Italian nationals by birth and thus even now Italian nationality inheres in them inalienably. She would not tell these truths. Had she told these truths, she could not have spoken what she spoke at Tilburg University. Yet, what she spoke remains the truth on record, while what she did not speak is the real truth. So what she spoke in Amsterdam is something other than truth. QED: the sense of loyalty to India which she claims came a trifle late, by 16 years! 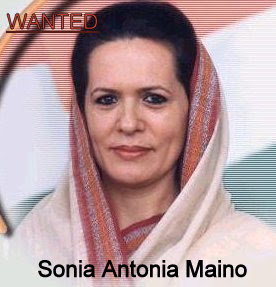 Exclnt article... Showcasing the real SONIA!! Time to show our fist! Am enslaved to my dream, but free in my steps!